1 Bdrm Grnd flr Flat. Hall. Lounge. Kitch. Bdrm. Bathrm (CT band - A). Garden. Parking. Fixed price £112,500 Entry by arr. Viewing contact solicitors. (EPC band - D). 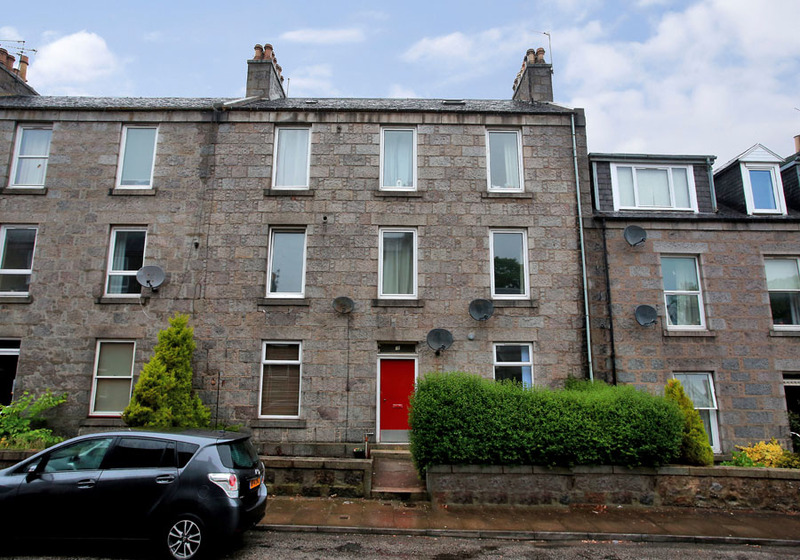 We present for sale this ONE BEDROOM GROUND FLOOR FLAT forming part of a granite tenement building protected by Security Entrance System, set in a quiet street within an established residential development close to the city centre. 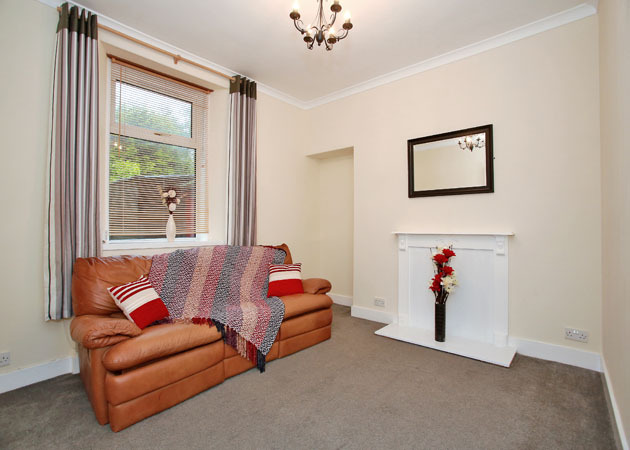 The property enjoys the comforts of Gas Fired Central Heating, together with Double Glazing and boasts well proportioned accommodation comprising Hallway, spacious Lounge, fitted Kitchen, Double Bedroom with built-in wardrobes and Bathroom fitted with a white three piece suite. 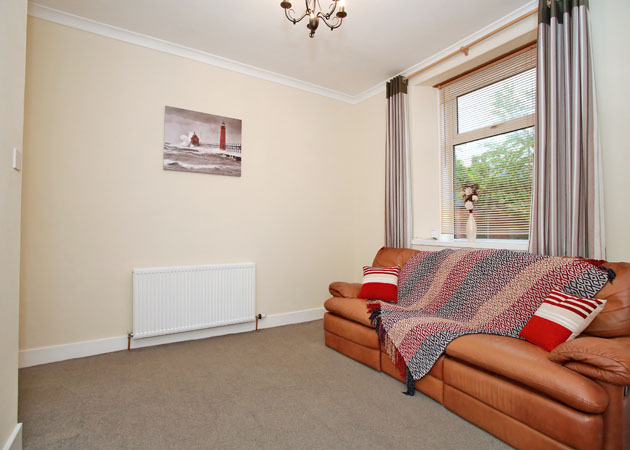 The property would make an excellent purchase for first time buyers or even those looking for a buy to let investment and accordingly internal viewing is highly recommended to appreciate the accommodation on offer. Chestnut Row is a quiet no through road which is situated in an area well served by local shopping facilities including a Sainsbury Superstore, by public transport facilities and extremely convenient for Foresterhill Hospital. From the west end of Union Street travelling east take a first left turn into Rose Street and continue straight onto Esslemont Avenue. At the second set of traffic lights take a right turn into Rosemount Place and continue to the roundabout. Take a left turn and branch right into Caroline Place, go through the lights onto Berryden Road and Chestnut Row is on the left hand side after the hospital. Number 18 is located ahead on the right. 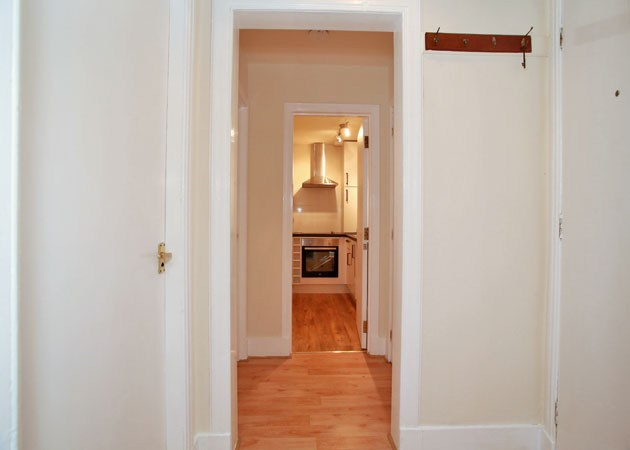 ENTRANCE HALLWAY: Welcoming Entrance Hallway permitting access to all accommodation with storage cupboard offering shelved space. Security entry system. Laminate flooring. LOUNGE: 13’4” x 12’8” approx. Spacious Lounge located to the rear of the property finished in a neutral décor allowing space for a variety of furnishings. Alcove space. Decorative feature mantel. Fitted carpet. KITCHEN: 9’ x 4’9” approx. Fully fitted Kitchen with white gloss base and wall units creating a stylish impression. Fitted appliances such as the Electric Oven, Ceramic Hob, Fridge and Washing Machine are all to be included within the sale price. Laminate flooring. 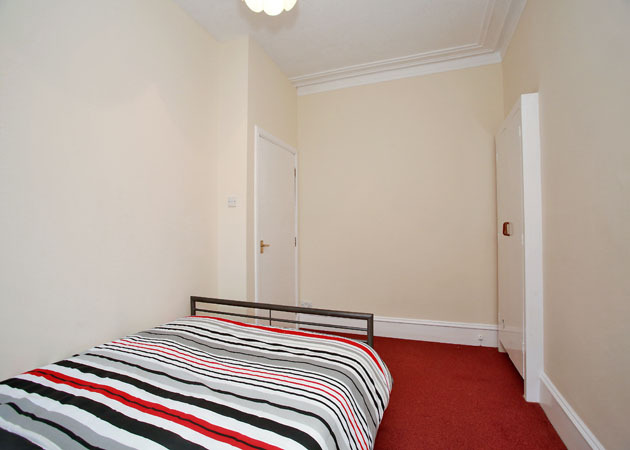 DOUBLE BEDROOM: 12’10” x 8’4” approx. 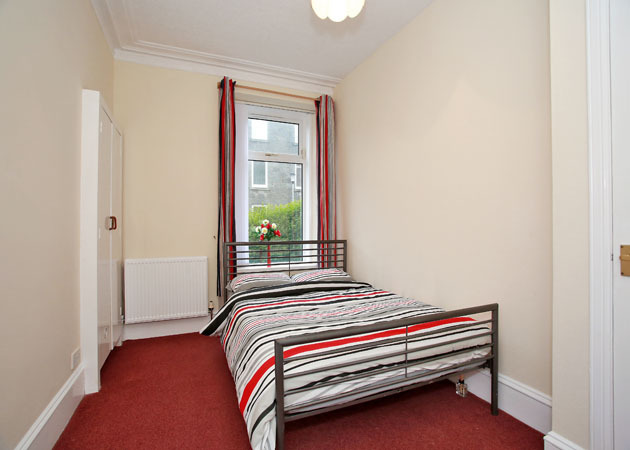 Generously proportioned Double Bedroom with ample space for various bedroom furnishings with pleasant outlook over the front garden. 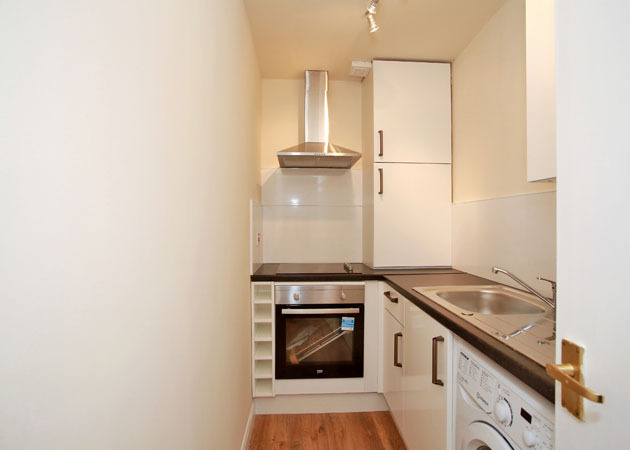 The property benefits from fitted wardrobes offering both shelved and hanging space. Fitted carpet. 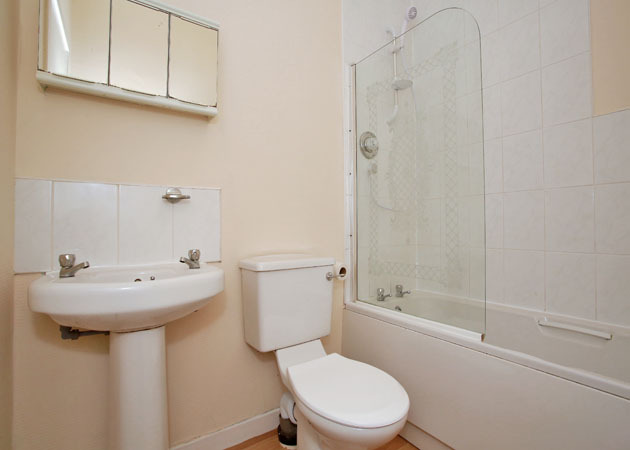 BATHROOM: The Bathroom has been fitted with a white suite comprising a w.c., wash hand basin and fitted gas mains shower over the bath with shower screen. Linoleum flooring.